When a snack attack hits, skip the store-bought snacks and grab a whole food or a homemade snack instead. Here are some tips for nibbling on the run. In your fridge, stock a shelf or drawer with healthy snacks so it’s easy to grab and go. At the beginning of the week, pack up snack baggies with healthy veggies, such as carrot sticks, green pepper slices, cherry tomatoes. In separate containers, pack hummus for dipping. Keep a fruit bowl on your kitchen counter so it’s easy for the kids to reach for a banana or peach. If you have a few extra minutes, add a spread and toppings and turn your plain fruit into a fruit surprise snack. Make your own goldfish shaped cheese crackers or whole wheat animal crackers using the recipes and cookie cutters in our Snack Happy kit. 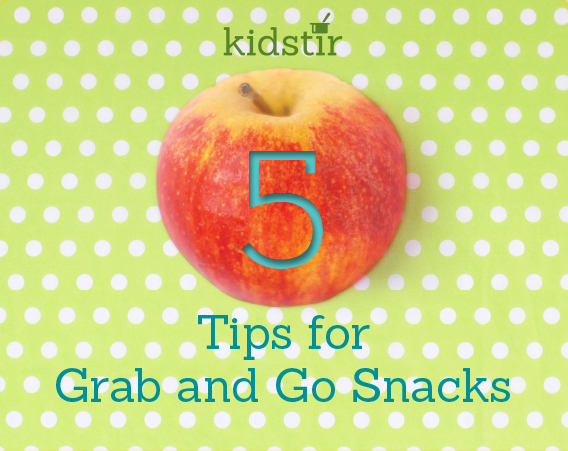 Print out our fun snack packs, too! For a salty snack, pack up some tortilla chips and salsa. The homemade versions are better for you than their store-bought cousins. Slip frozen bite-size pieces of fruits such as grapes, bananas, and oranges onto toothpicks,. Or, mix fruit together with yogurt, and freeze into a yummy yogurt bark.